Research in the Magnus Lab is focused on the total synthesis of natural products. Alkaloids, terepenoids, ketolides, and other classes of natural products have all been completed in our labs. All of the current projects involve the development of new concise strategies and this, in course, frequently leads to the discovery of new reactions. These projects are summarized below. 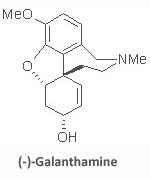 Total Synthesis of (-)-Galanthamine: The amaryllidaceae alkaloid (-)-galanthamine is a potent acetylcholinesterase inhibitor and has found extensive use in the early treatment of Alzheimer’s disease. This has caused a renewed interest in its synthesis, since its extraction from the bulbs of snow drops does not supply sufficient material for the clinical evaluation of early Alzheimer’s patients. Currently, commercial supplies of galanthamine are available from Sanochemia AG using the Frohlich-Jordis route in nine steps and an overall yield of 12%. 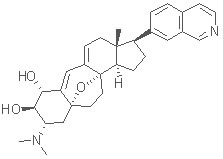 Total Synthesis of Codeine: Since the report by Robinson in 1925 of the structures of codeine and morphine there have been numerous total and formal syntheses of these alkaloids spanning a period of approximately 55 years from 1952 to 2007. Nevertheless, there is no practical synthetic source of these opium alkaloids other than the Rice adaptation of the Grewe strategy. Total Synthesis of Platensimycin: Discovered in 2006 by scientists in the Merck Research Laboratories, platensimycin is the first member of a new class of antibiotics. Platensimycin exhibits potent antibiotic properties toward gram-positive pathogens, working by inhibition of bacterial fatty acid biosynthesis. Total Synthesis of Silvestrol: Isolated in 2004 from the twigs and fruits of Aglaia foveolata (Pannell), Silvestrol shows cytotoxic activity comparable to Taxol. No total synthesis of silvestrol has been published to date, but there have been numerous syntheses of the parent rocaglamide and the 1,4-dioxanyloxy fragment. Our strategy uses a Nazarov cyclization to form the cyclopenta[b]benzofuran skeleton.